Preheat oven to 180 C, 350 F. Grease a 6-mold donut pan with coconut oil. Combine the dry ingredients in a bowl. In another bowl combine all of the wet ingredients except egg whites. Mix the wet with dry and set aside. Beat the egg whites until firm peaks form (very important). Gently fold the egg whites into the batter. Equally distribute the batter between the 6 donut molds. 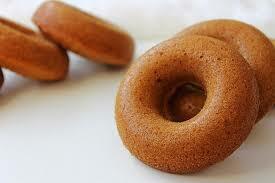 Smooth out the tops of each donut. Bake for 12-15 minutes until lightly golden. Serve with cream or coconut sugar and cinnamon.